The six-strikes Copyright Alert System has been active for a while but recently Comcast reached a new milestone when the ISP sent out its one millionth copyright warning. The alerts are mostly educational in nature but repeat offenders face a browser hijack. February last year the MPAA, RIAA and five major Internet providers in the United States launched their “six strikes” anti-piracy plan. The main goal of this Copyright Alert System is to educate the public. Through various notifications subscribers are informed if their connections are being used to share copyrighted material without permission, and told where they can find legal alternatives. Thus far the Center for Copyright Information (CCI), which oversees the program, has only released details of the number of warnings that were sent out during the first 10 months. During this period 1.3 million anti-piracy alerts were sent out. This year the number of notices are expected to double, but no exact details have yet been released. However, based on information received last week we can now report that Comcast sent out its one millionth warning recently. A million warnings translates to a little under 2,000 notices per day, a similar rate to the one we reported earlier this year. The ISPs and copyright holders previously agreed to cap the Copyright Alert volume, which may hover around this number. TorrentFreak asked Comcast to verify our findings, but the Internet provider would neither confirm nor deny that it has sent out 1,000,000 alerts. “We have no official data to disclose at this time,” a Comcast spokesperson wrote in a brief emailed reply. So what’s in store for those who receive an alert? ISPs and copyright holders have stressed that the focus of the Copyright Alerts lie in education, but repeat infringers face a temporary disconnection from the Internet or other mitigation measures. For example, Comcast has chosen a browser “hijack” which makes it impossible for customers to browse the Internet, but without interrupting VOIP and other essential services. 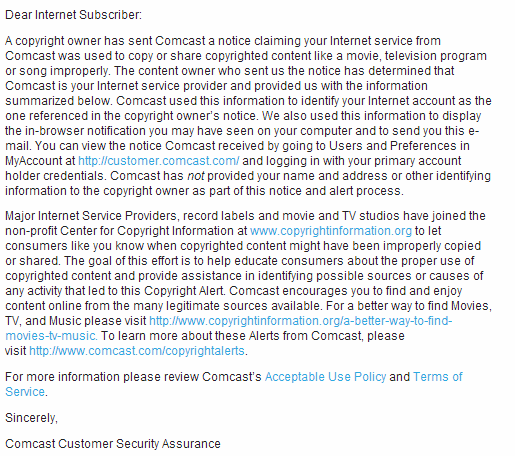 “If a consumer fails to respond to several Copyright Alerts, Comcast will place a persistent alert in any web browser under that account until the account holder contacts Comcast’s Customer Security Assurance professionals to discuss and help resolve the matter,” Comcast writes. How quickly customers will be able to resolve the matter and what they will have to do is unknown, but Comcast stresses that no accounts will be terminated under the Copyright Alert program. Thus far there’s no evidence that Copyright Alerts have had a significant impact on piracy rates. However, the voluntary agreement model is being widely embraced and similar schemes are in the making in both the UK and Australia. c There are 68 comments. Add yours?